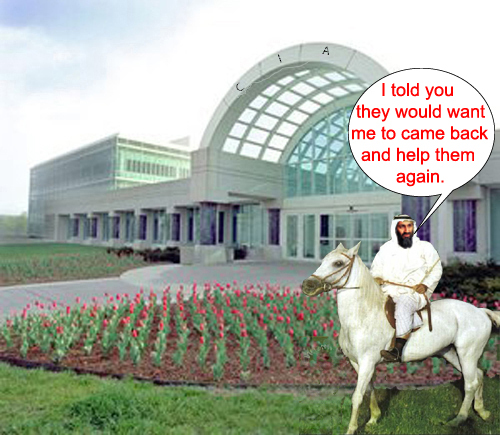 Bin Laden to rejoin the CIA. And fight in the new American Jihad. The Great Christian Fundamentalist George W Bush has forgiven Bin Laden and issued a Fatwa on all Shi�as in Iraq and the rest of them in Iran. Bin Laden thinks the Shi�a are even bigger infidels than the Americans. Bush promised a new �Shock and Awe�, as the last one on Iraq didn�t work out so well. The only ones shocked and awed were ourselves at the resistance we encountered. Our moderate and tame Arab leaders have told Bush to attack the Shi�a in Iran before they storm Mecca and Israel has told him to hurry up. The Arab leaders have told Bush to make a show of fixing the Palestinian problem but not to dare fix it, as they would be next on the list for sorting out. This Bush is some major clown to get involved in 1,000 year old struggles.